In the previous posts we had discussed generation of a correlated Rayleigh fading sequence using Smith’s method  and Young’s modification of Smith’s method . The main contribution of Young was that he proposed a mechanism where the number of IDFTs was reduced by half. This was achieved by first adding two length N IID zero mean Gaussian sequences filtered by the filter F[k] and then performing the IDFT on the resulting complex sequence. This was different to Smith’s method where the IDFT was performed simultaneously on two branches and then the outputs of these branches were added in quadrature to achieve the desired sequence with Rayleigh distributed envelope and Uniformly distributed phase. 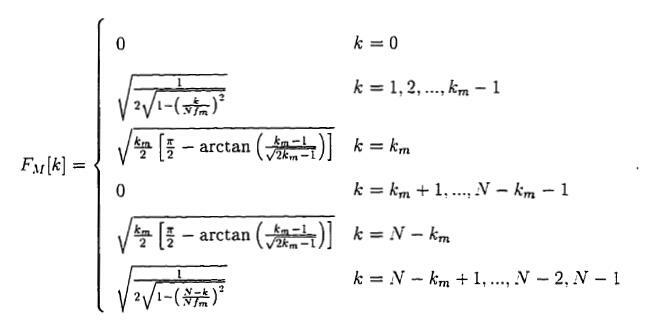 Another problem with Smith’s method was that the outputs of the two arms after performing IDFTs was assumed to be real which is not always the case in implementation and depends upon the combination of Doppler frequency (fm) and length of Gaussian sequence (N). Young’s technique is shown graphically in the above figure. Also shown is the definition of filter F[k] which depends upon N, fm and km (please note that the fm in the above equation is normalized by the sampling frequency fs). Here km = N*(fm/fs). 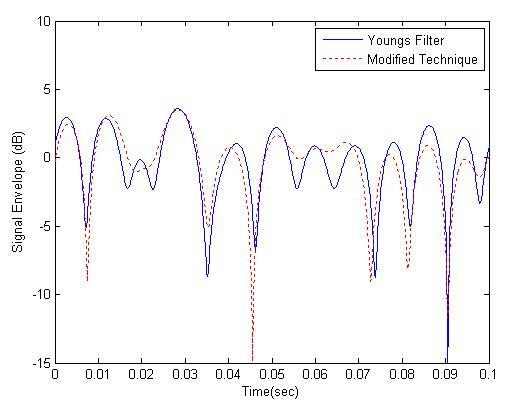 We propose three modifications to Young’s technique which significantly reduces computation and at the same time maintains the statistical properties of the generated sequence. The modifications we propose are. 1. First modification has to do with the generated Gaussian sequence. 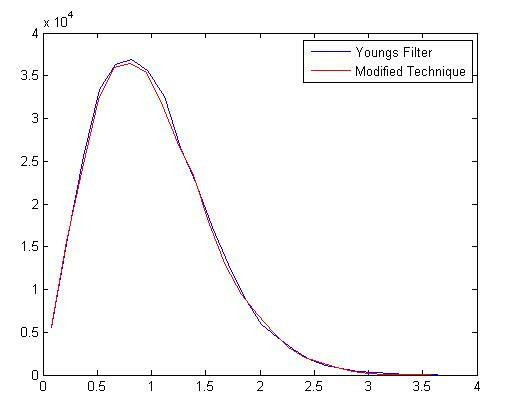 It is observed that the filter F[k], at very high sampling rates, is mostly zero and there are very few points which have some non-zero value. So when we multiply the Gaussian sequence with the filter we mostly get zeros at the output. So we propose that the filter response in the frequency domain must be calculated first and the the Gaussian random sequence must be generated for only those points where the filter F[k] is non-zero e.g. for a sampling frequency of 7.68 MHz (standard sampling frequency for a BW of 5 MHz in LTE) and Doppler frequency of 70 Hz (corresponding to medium Doppler case in LTE) the filter F[k] has 99.9982% zeros in its frequency response and it would be a highly wasteful to calculate Gaussian RVs for all those values. 2. Secondly according to Clarke  the Doppler Spectrum measurements have “Marked disagreement at very low frequencies and at frequencies in the region of the sharp cut-off associated with the maximum Doppler frequency shift. At very low frequencies the spectral energy is always observed to be higher than that predicted by theory”. He goes on to add “The reason for this is that neither theoretical model takes into account the large scale variations in total energy which result from the changing topography between transmitter and mobile receiver”. This suggests that the Classical Doppler Spectrum might not be the best choice under all scenarios. This has also been noted in  where a flat fading model is evaluated in terms of its Level Crossing Rate and Average Fade Duration. Such a flat spectrum is especially suited to indoor scenarios as noted in  and . We propose a filter that gives equal weight to all the frequencies up to the maximum Doppler frequency. So our filter is a box-type filter which applies a constant scaling factor to all the frequencies in the pass-band and zeros out all the frequencies in the stop-band. So in fact the Gaussian sequence that is generated in the in-phase arm may directly be added with the Gaussian sequence from the other arm without applying the frequency domain filter and then IDFT of the complex sequence is taken. We will look into the deviation from ideality that this causes later. 3. The third modification that we propose is in the implementation of the IDFT. Here again we take into consideration that the complex sequence being fed to the IDFT is filled with zeros (as we noted earlier 99.9982% zeros for 7.68 MHz and even more for higher frequencies) so we can avoid a lot multiplications and summations. The IDFT is defined below and also given is our modification to it. Further improvement in computation time is achieved by implementing the above as a matrix multiplication. The matrix multiplication is implemented as H*X where H is the IDFT coefficients of size N x 2(km+1) and X is a vector of size 2(km+1) x 1 upon which the IDFT has to be performed. Now let us look at the output sequence generated by using the above techniques. We consider the case of Medium Doppler Frequency of 70 Hz (EVA channel) as defined by LTE specifications. 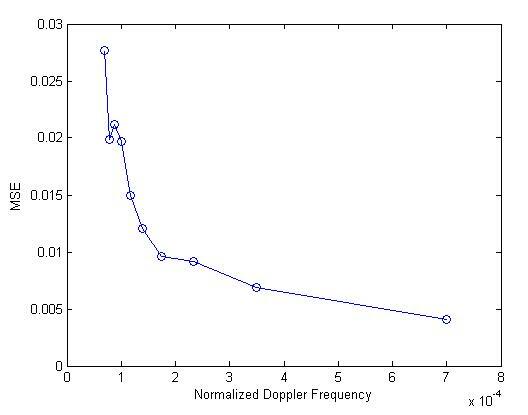 Sampling frequency is fixed at 10 kHz giving a normalized Doppler frequency of 0.007. This was done due to limitation of memory on the machine. The author also experimented with a sampling frequency of 7.68 MHz but this did not yield enough samples for statistically accurate results. We did use a sampling frequency of 7.68 MHz for our bit error rate simulation which is shown in the end. 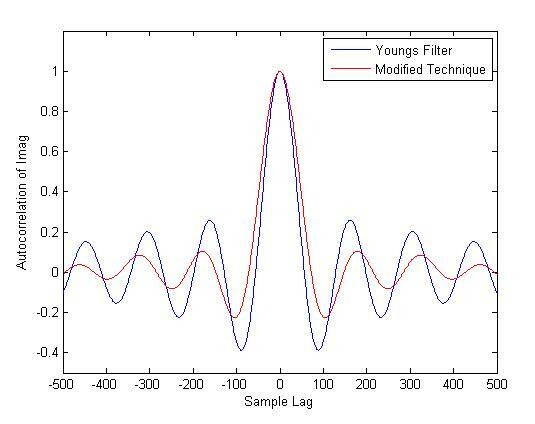 It is observed for fm=70 Hz the envelope of the output sequence using the proposed technique matches quite well with the envelope of the output sequence generated by the ideal filter proposed by Young. Also the phase and envelope of the sequence generated using the proposed technique has the desired distribution. Some of the other metrics that we can look at are the level crossing rate (LCR) and average fade duration (AFD) as well as the Auto Correlation of the real and imaginary parts of the complex sequence generated. If we look at the results for LCR and AFD we see that the simulated results match reasonably well with the results predicted by theory. These results correspond to 100 snapshots of the fading sequence. It was important to take the average of several snapshots as results varied with each simulation run. Sometimes Young’s technique produced more accurate results while at other times the proposed technique was better. Again the limitations of computer memory and processing power dictated the length of the sequence that could be generated. In general Young’s technique produced better results than our proposed technique. It was found that product of LCR and AFD for both cases matched quite well with the theoretical value. So the total time spent in a fade state per second was equal in both the cases. In the proposed method the duration of a single fading event was higher, whereas the number of fading events per second was lower. This can be attributed to the fact that in our proposed technique higher weighting is given to lower frequency components and the fading sequence is smoothed out by these low frequency components. One technique to overcome this is spectral broadening as suggested by  but this is not the subject here and we postpone its discussion to another article. The Auto Correlation of the real and imaginary parts of the generated sequences are also calculated for a Doppler frequency of 70 Hz. It is found that the Auto Correlation sequence for the two techniques matches quite well. However, the Auto Correlation sequence deviates from the theoretical value as calculated the by Bessel function of the first kind and zero order. Since we have used a flat spectral mask the Auto Correlation function resembles the sinc(x) function which is the same as zeroth order Spherical Bessel Function of the first kind (which is related to 1/2 order Bessel Function of the first kind). It was found that when the Rayleigh fading sequence is generated by the program provided in Young’s thesis the shape of the Auto Correlation function depends upon the sampling frequency. 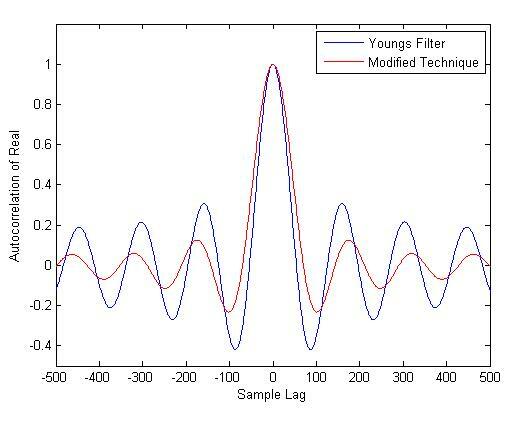 At a normalized Doppler frequency of 0.05 and N=2^16 Young’s technique produces quite accurate results. We also measured the mean squared error (MSE) between the two Auto Correlations sequences and found it to be a function of the Normalized Doppler Frequency. It was found that as the Normalized Doppler Frequency was increased from 0.00007 to 0.0007 the MSE error dropped from 0.0277 to 0.0041. The relationship between the Normalized Doppler Frequency and MSE, for a fixed sequence length, seems to be resembling an exponential function. For more accurate results, at higher sampling frequencies, the number of samples would have to be increased considerably. In fact it was found that if the variable km (km=N*fm/fs) is maintained at around 20 the error between the two correlation sequences is less than 1% for all possible sampling rates. We also compared the bit error rate (BER) performance of different QAM modulation schemes using both the techniques for fading envelope generation and found these to be matching quite well. A single tap was used which results in a flat fading channel. This is a simplistic channel model but it gives us some confidence that the proposed approach does have the desired statistical properties. A good test of a temporally correlated Rayleigh fading sequence is to test it on a system that implements interleavers and channel coders whose performance strongly depends upon factors such as the LCR and AFD e.g. a certain forward error correction (FEC) code might work well in high LCR and low AFD as this distributes out errors in different blocks and allows the code to correct them. In simulations done so far (not shown here) we have found that for a 1/2 rate convolutional encoder with Hard Viterbi Decoding the BER for the two schemes matches quite well. In general the results for correlated fading are much worse than uncorrelated fading. 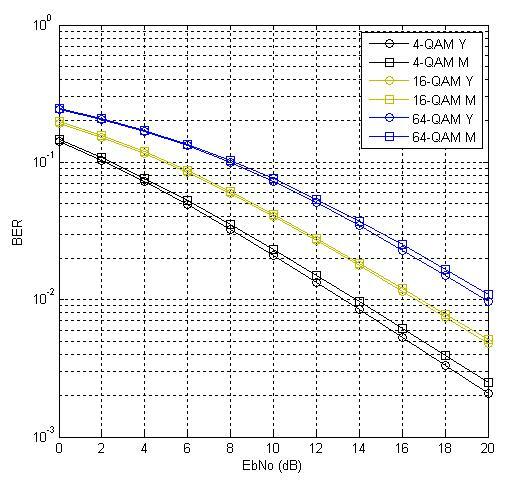 In future we would also like to evaluate the bit error rate (BER) performance of an M-QAM OFDM system with Frequency Selective Rayleigh fading as described by the LTE fading channels EPA, EVA and ETU. This is probably a good scenario to compare the accuracy of the two techniques used to generate Rayleigh fading sequences above. One challenge in this regard is that the LTE channel taps are described in increments of 10 nsec whereas the LTE signal sampling rate is defined on a different scale (minimum Ts=32.5521 nsec corresponding to a sampling rate of 30.72 Msps). So we would have to do sample rate conversion to implement a time varying frequency selective Rayleigh fading channel. John I. Smith, “A Computer Generated Multipath Fading Simulation for Mobile Radio”, IEEE Transactions on Vehicular Technology, vol VT-24, No. 3, August 1975. David J. Young and Norman C. Beaulieu, “The Generation of Correlated Rayleigh Random Variates by Inverse Discrete Fourier Transform”, IEEE Transactions on Communications vol. 48 no. 7 July 2000. R. H. Clarke, A Statistical Theory of Mobile Radio Reception”, Bell Systems Technical Journal 47 (6), pp 957–1000, July 1968. Rosmansyah, Y.; Saunders, S.R. ; Sweeney, P.; Tafazolli, R., “Equivalence of flat and classical Doppler sample generators,” Electronics Letters , vol.37, no.4, pp.243,244, 15 Feb 2001. JTC (Joint Technical Committee T1 RIP1.4 and TIA TR46.3.3/TR45.4.4 on Wireless Access): “Draft final report on RF channel characterization”. Paper no. JTC(AIR)/94.01.17-238R4, January 17, 1994. ETSI (European Telecommunications Standards Institute): “Universal mobile telecommunications system (UMTS); selection procedures for the choice of radio transmission technologies of the UMTS (UMTS 30.03 version 3.2.0)”. Technical Report, TR 101 112 V3.2.0 (1998-04), http://www.etsi.org, 1998.